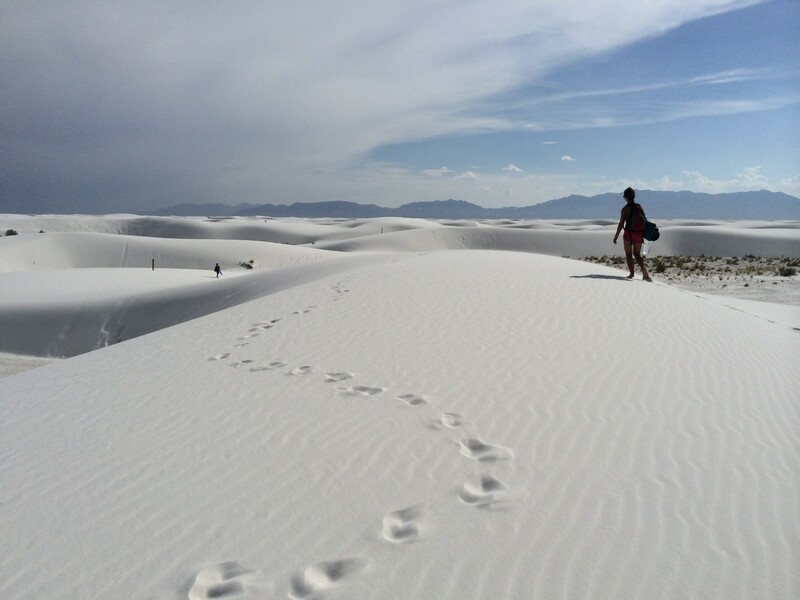 Any visit to White Sands National Monument is unforgettable and backpacking White Sands is even better. All you can see is hill after hill of powdery white sand for miles and the patterns that the wind makes in the dunes are spectacular. 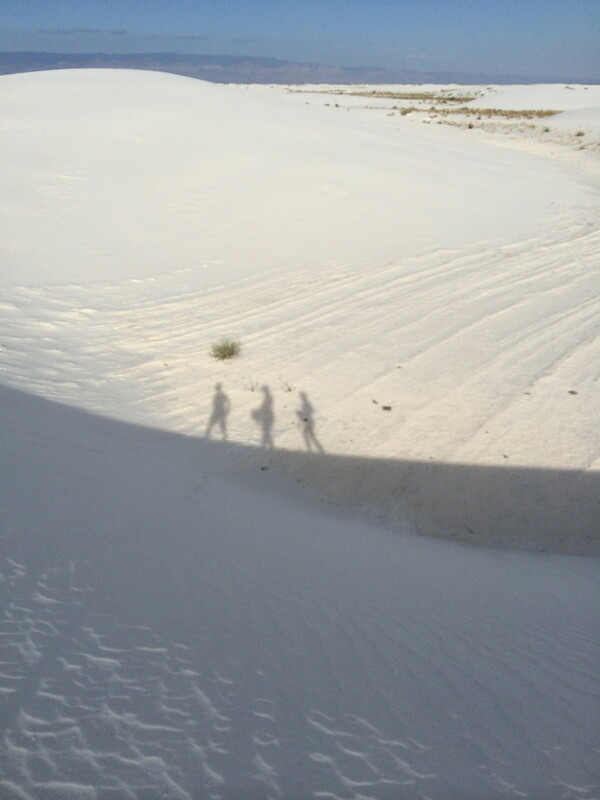 We ended up backpacking White Sands somewhat by accident. 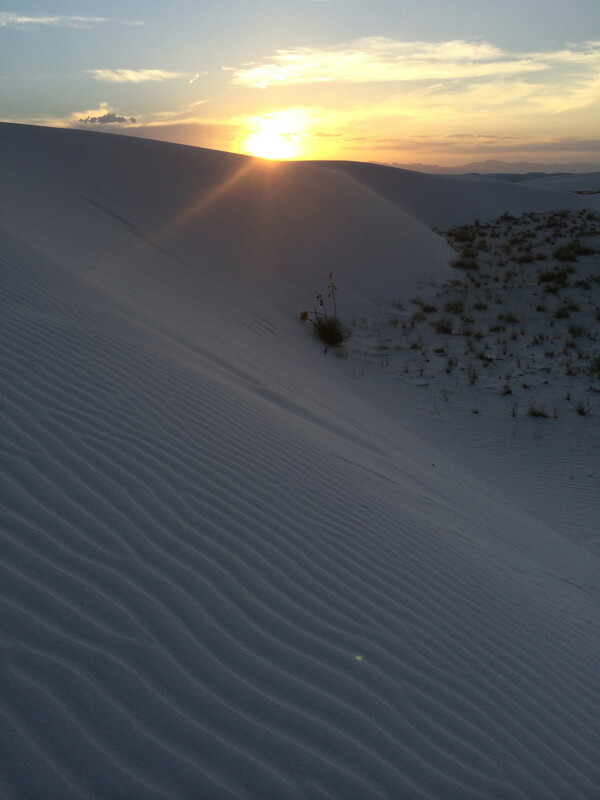 While visiting family in Albuquerque on the way to Texas’ Big Bend National Park, I happened upon a picture taken in White Sands. When I realized we could easily sneak in a visit on the way to Big Bend, I decided we should spend one night backpacking the glorious area. Click here for the backcountry brochure. We all were really excited! 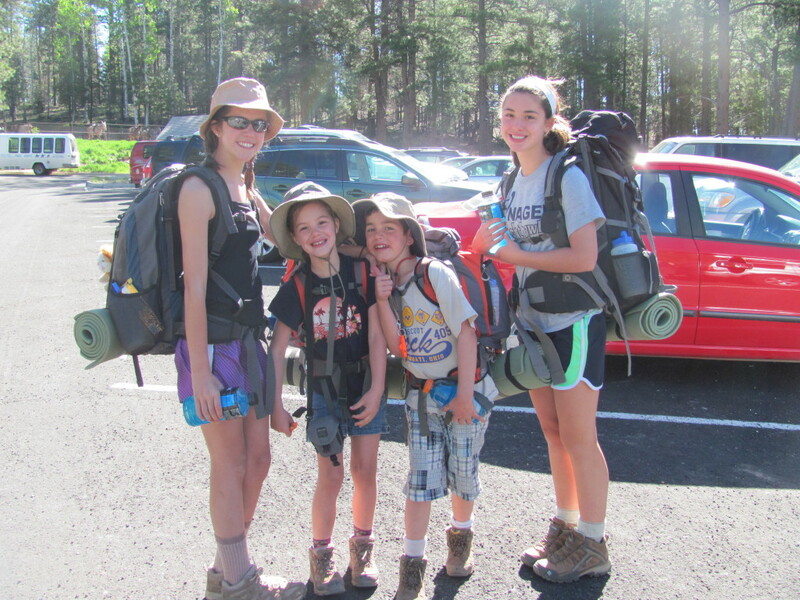 The ten backpacking sites can not be reserved in advanced, so we hoped we would luck out and get a site. Turns out that not that many people wanted to camp in the desert during our July visit, and only three of the sites were taken. Yay! 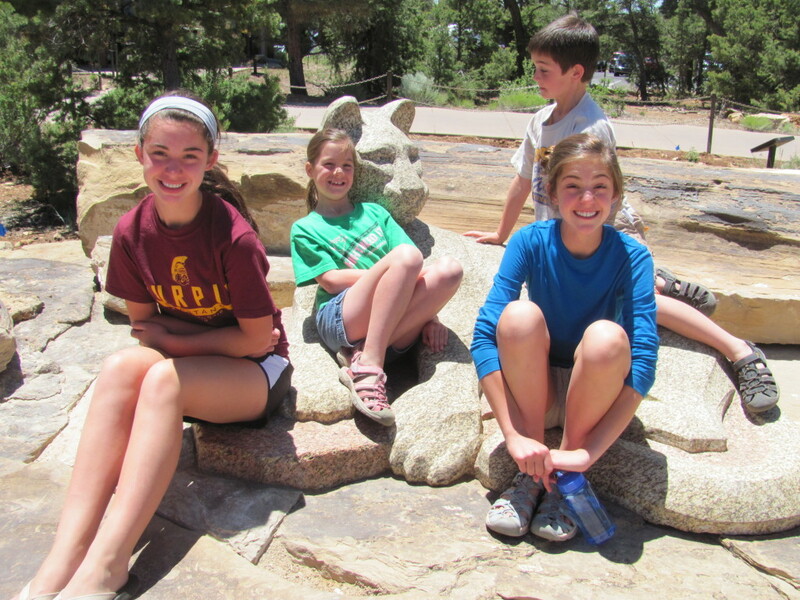 We spent time exploring the Visitor Center, filled our water bottles and picked up snacks at the well stocked gift shop before heading down Dunes Drive to the backpacking loop trailhead. While the temperature was hot when we arrived late in the afternoon (average temps in July are 95 degrees! ), it is much cooler and quite comfortable when the sun sets. It took us about a half hour to hike to our site following the posts in the sand leading the way. Campsites are spread out among the dunes so quite private, and we pitched our tent in one of the most unique terrains I had ever experienced. We especially loved seeing the black beetles prevalent to the area walking around leaving their little tracks in the sand. Once we set up camp, we spent the evening playing on the dunes and watching one of the most beautiful sunsets and the lights of the nearby town off in the distance. It was a lovely night and one I will never forget. We were just about to head into our tents for the night, when we noticed some pretty intense lightning far off in the distance. And this is when things took a turn for the worst. Having grown up in Florida, I am no stranger to lightning, and also have a healthy (though sometimes irrational) fear of it. Knowing we were in the middle of dunes with nothing tall around, I was worried but since the lightning was far off, I hoped the storm would not head our way and we zipped into our sleeping bags for what I prayed was a peaceful night. I had just fallen asleep when the wind picked up dramatically practically flattening our tents and the far away lightning was suddenly much closer. I’ll admit it, I panicked. I decided then and there that we needed to get back to our car to ride out the storm. I roused all the kids and told them we were going to make a run for it. While they protested, I insisted and off we started running towards the car in our pajamas. In the dark. In the desert. In a storm. In my panic, I hadn’t even grabbed water. What’s worse is that my fear rubbed off on the kids and suddenly the peaceful night had turned into total chaos. We rushed to the nearest marker post, and then kept running to reach the next one. At this point, Naomi ran out in front so we all followed her up and down the dunes. We had been running for several minutes, when I realized that we had not seen a marker post in a while. Calling out to Naomi asking if she could see one up ahead, my heart sunk as she yelled back that she hadn’t been watching for them, and could not see a single one. I yelled for everyone to stop running and we climbed the closest dune to make sure we were heading the right direction towards the town lights we had seen earlier. Imagine the fear that took hold of me when I realized we had been running in the exact opposite direction. My panic had led me to make some pretty stupid decisions and the hills and hills of dunes are totally disorienting, especially in the dark. So now we were lost, with no water, and the storm was moving in. Realizing the gravity of the situation, we all got super quiet, held hands and said a prayer asking God to keep us safe and help us find our way. 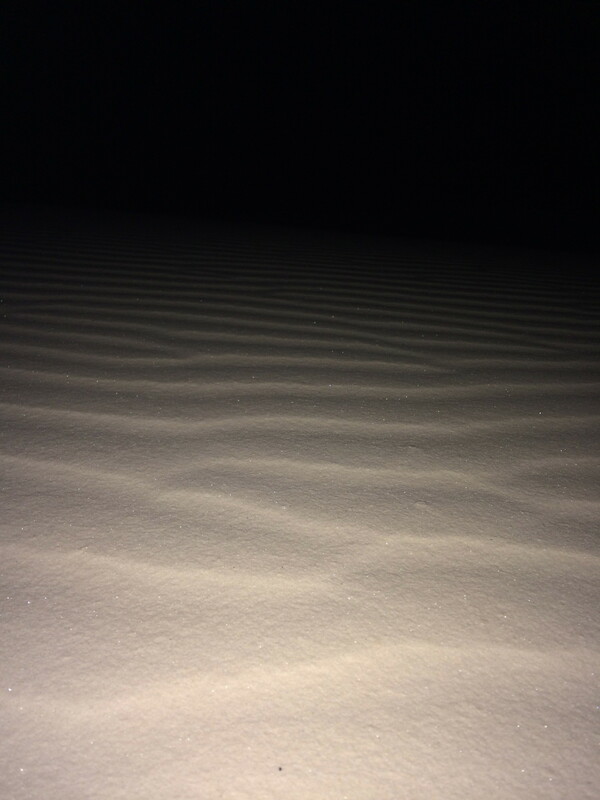 We decided to use the far off lights to guide us, and we quietly climbed dune after dune stopping at the top of each one to be sure we were heading in the right direction. It was beyond scary. I had just about decided that we were going to have to find a low lying area and wait out the storm in the open, when we walked over a dune and stepped onto Dunes Drive. I cannot tell you how relieved we were that our prayers had been answered. We had wondered several miles off course and it was quite a hike to get back to the car, but we knew we were at least heading towards safety and shelter. After about an hour of walking, we reached the car and we all whooped for joy. Amazingly, the skies opened up the minute we opened the doors so we all dove in just in time. The rain was strong and lightning was flashing all around, but we were safe in our car, although definitely humbled and shaken up. We all knew that we had been in a situation that could have turned out terribly. We spent a sleepless night reliving the last few hours. I am so grateful to have learned what NOT to do when in a scary situation. That I should not let panic and fear make me abandon every bit of common sense. That I need to be the voice of reason when in a stressful situation with my kids. That one person needs to be the leader at a time and we should not follow anyone until we know who that person is. 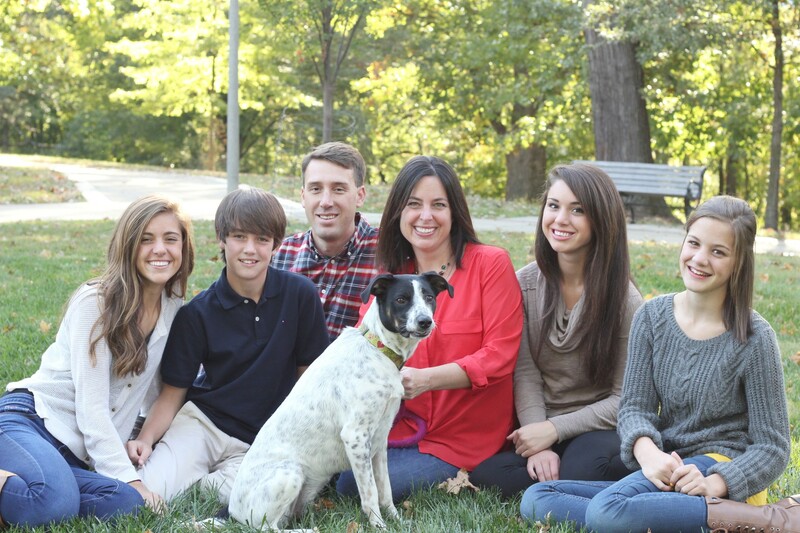 I also learned that my kids are pretty freaking amazing. Their faith that God would help us and sense of calm they had while blindly walking towards an unknown destination is truly inspiring. When the sun rose, we all shakily climbed out of the car and hiked back to our site to pack up. 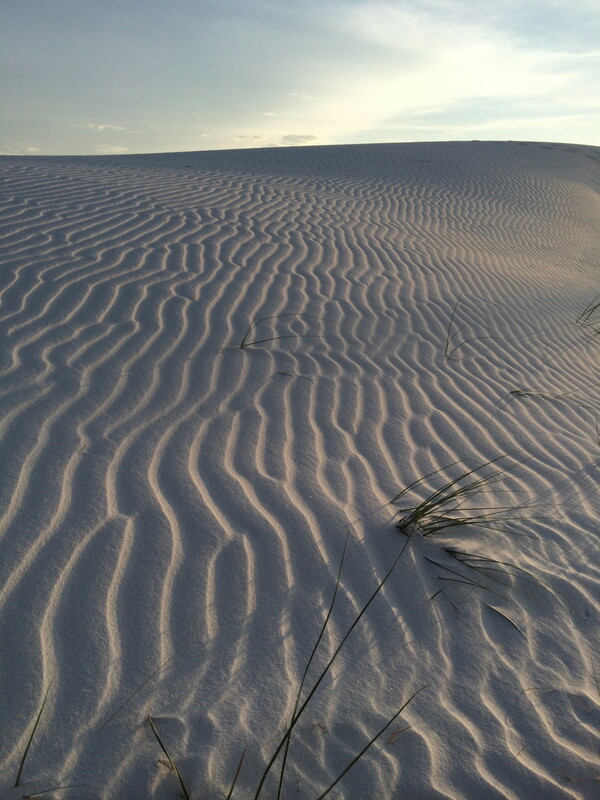 The dunes were once again beautiful. 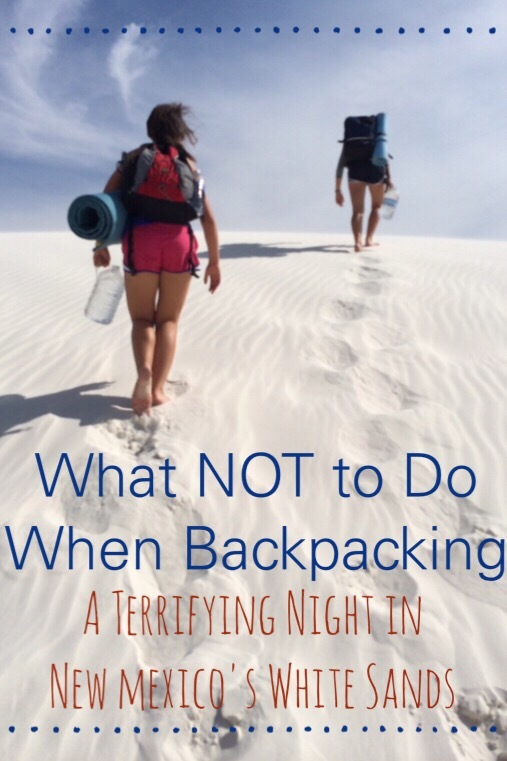 While terrifying, our night spent backpacking White Sands was one we love to reminisce about and a night filled with lessons we will never forget. 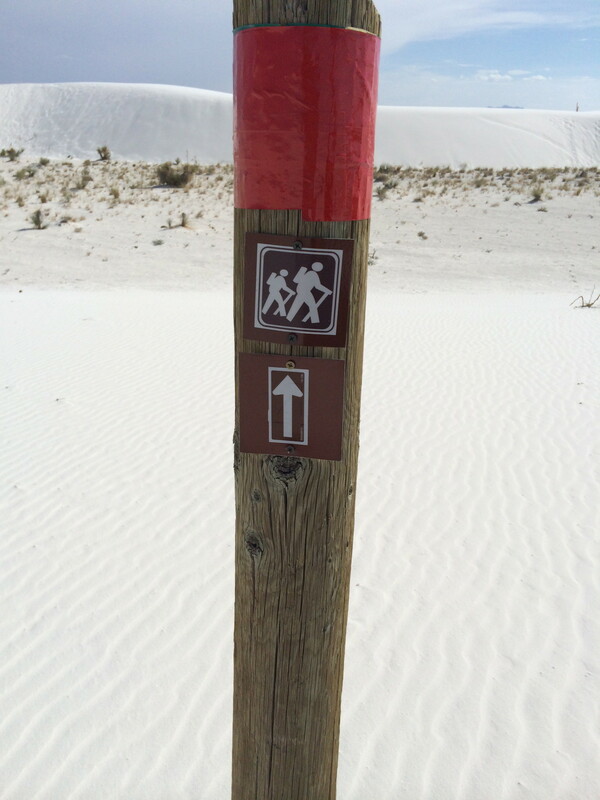 White Sands National Monument is adjacent to the White Sands Missile Range and sometimes closes for short periods as a result of missile testing. Click here for more information about the missile range and park closures. 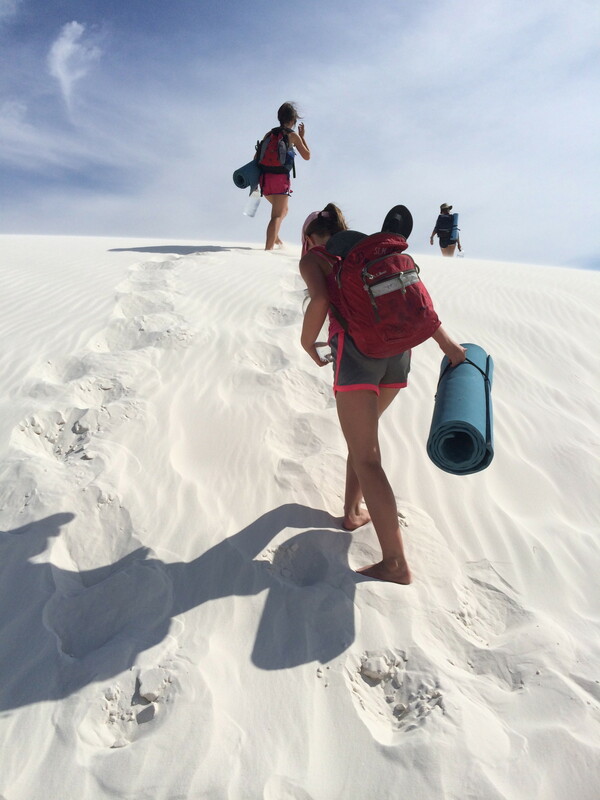 Weather out for a day hike or backpacking White Sands, it is essential that you pack more water than you think you need. I cannot stress this enough. We each carried a gallon of water to our site and while heavy, this is no place to be low on water. It is also important to have plenty of sunscreen as there is very little shelter from the sun while in the dunes. Hats and sunglasses are also a must. We hiked in shorts and tank tops, but brought light jackets for after sunset. The sand is hot during the day and hurt our bare feet, so everyone wore sandals while hiking. My sturdy Chacos were perfect for the terrain. 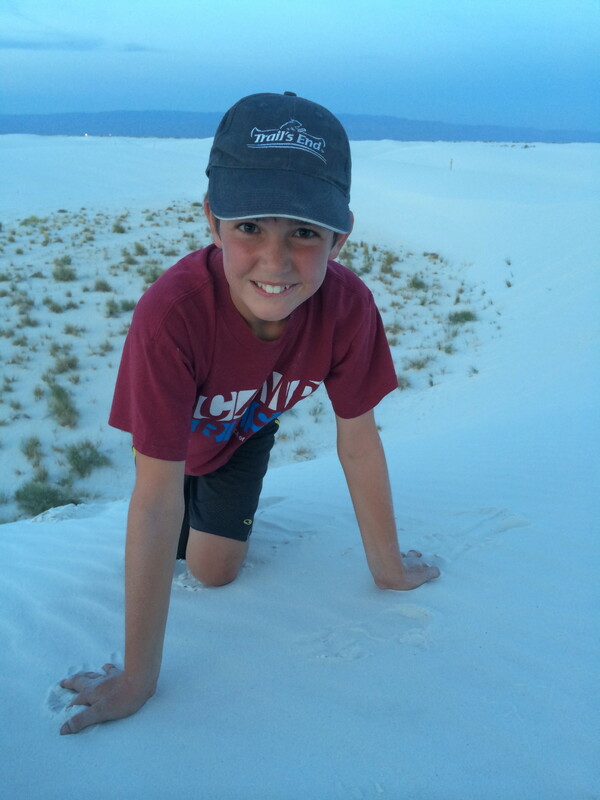 While available for purchase in the gift shop, it is a good idea to bring your own Snow Disc for sliding down the dunes as they are priced at a premium in the park. We lucked out as we were given a disk and a stick of wax for making it slide by a family leaving the park as we were pulling in. 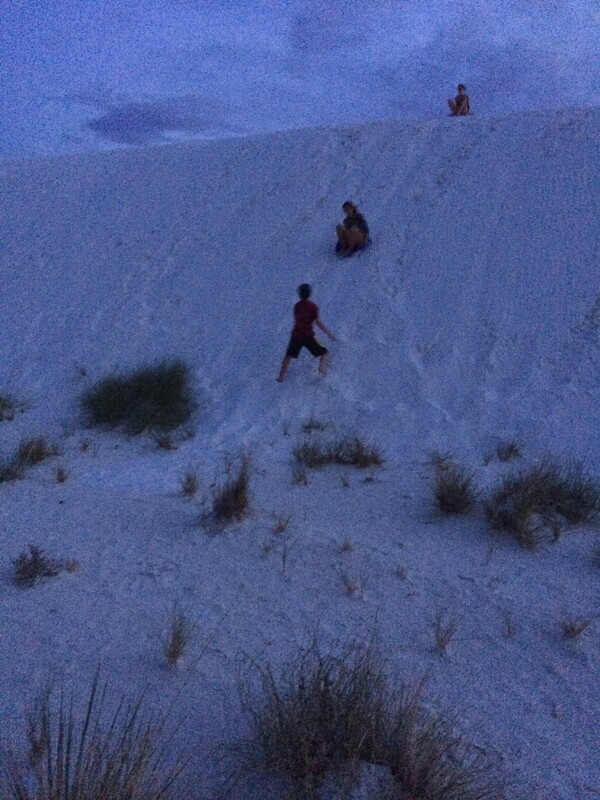 We had a blast sliding down the dunes near our site as the sun was setting. It was also fun to pay it forward and give the disc to another family the next morning. 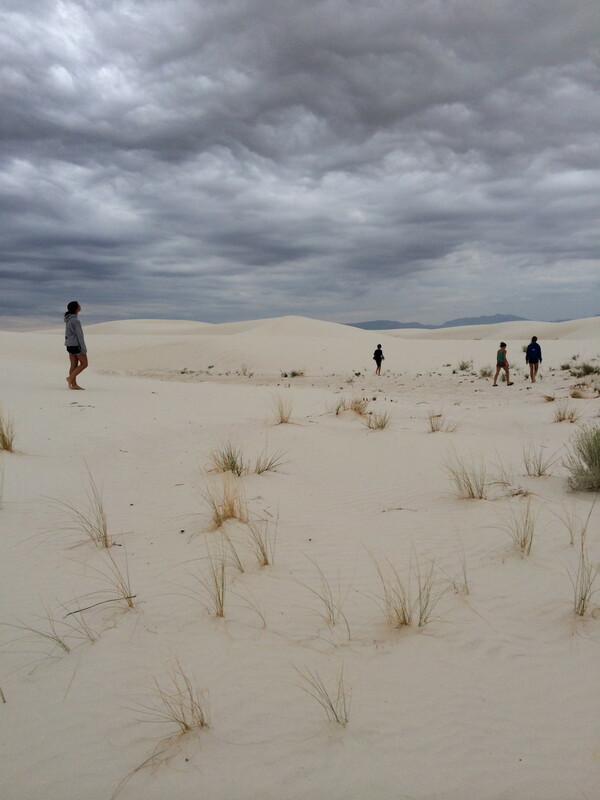 And lastly, if you are backpacking White Sands and a storm rises up, don’t just blindly run in the wrong direction. Stay calm, pray, and make sure you can see the next post before leaving the first one. Lesson learned. Have you ever been out in nature and been overwhelmed like we were? I’d love to hear about it! 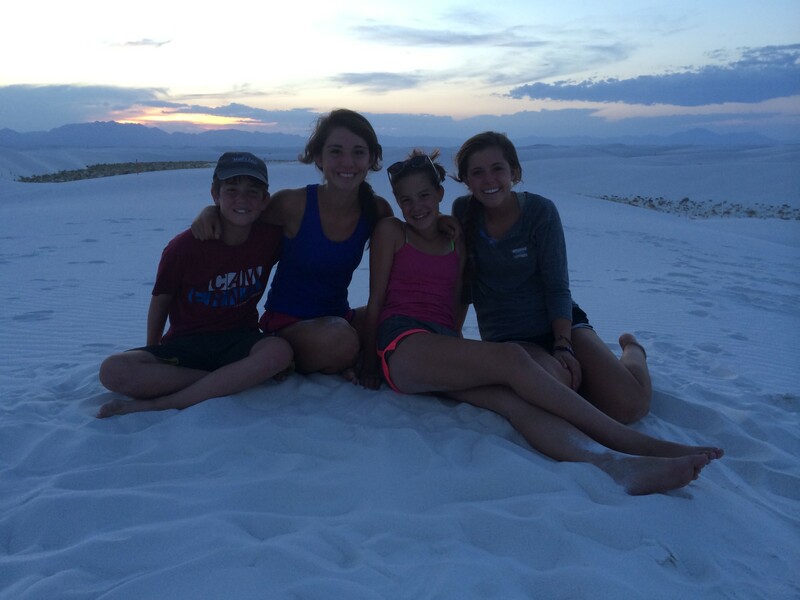 We visited Whites Sands several years ago and our family still talks about it today. Our time in the park was not as adventurous is yours but we enjoyed it immensely. Thanks for sharing your tips; I too am a person that panics before thinking. Working on it but praying for no panicking situations! Thanks so much for visiting Missy! 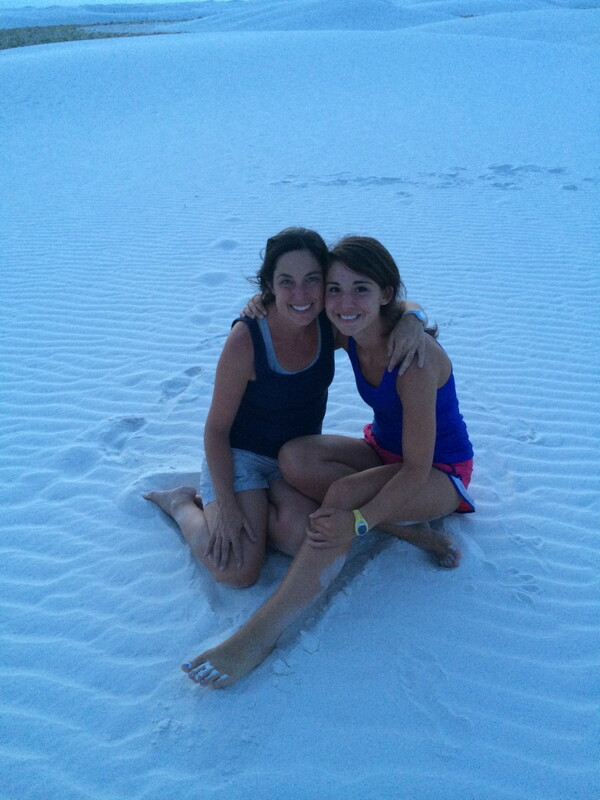 Isn’t White Sands awesome? I can’t wait to read about your adventures on your converted bus! What a cool way to see the U.S.and your home on wheels looks amazing! Thank you for introducing me to somewhere i hadn’t heard of. Terrifying night though. I hope you get to visit. It really is an amazing place. 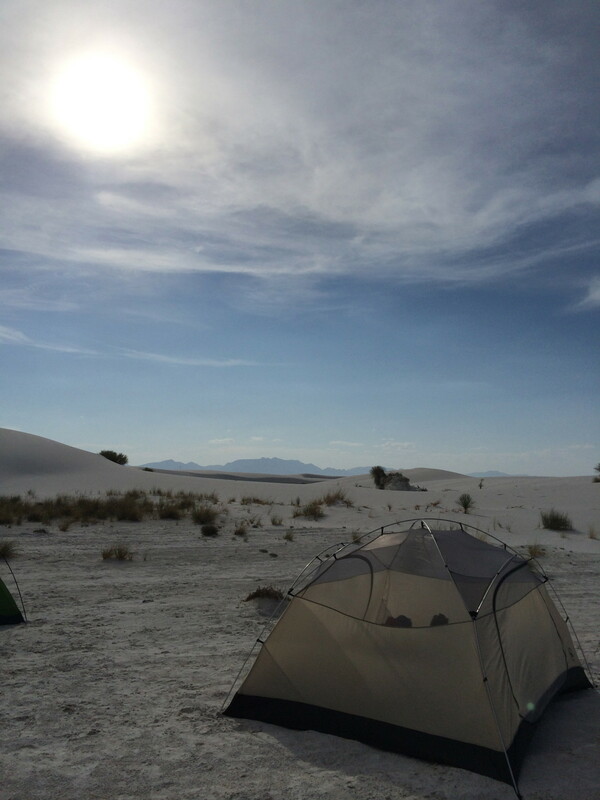 We went to White Sands over the weekend and it is now one of my favorite places to camp! The experience is like no other. Watching the dunes glow and sunrise and sunset is magical. I am so glad you got to visit there. Definitely unforgettable!! That’s terrifying! I was trapped in a desert thunderstorm at Big Bend National Park a few years ago, and we also had to make a retreat for the car. Those storms are astonishing. There’s really no word for how incredibly powerful and overwhelming they are. I feel like thunderstorms are one danger of the desert that people tend to forget about. 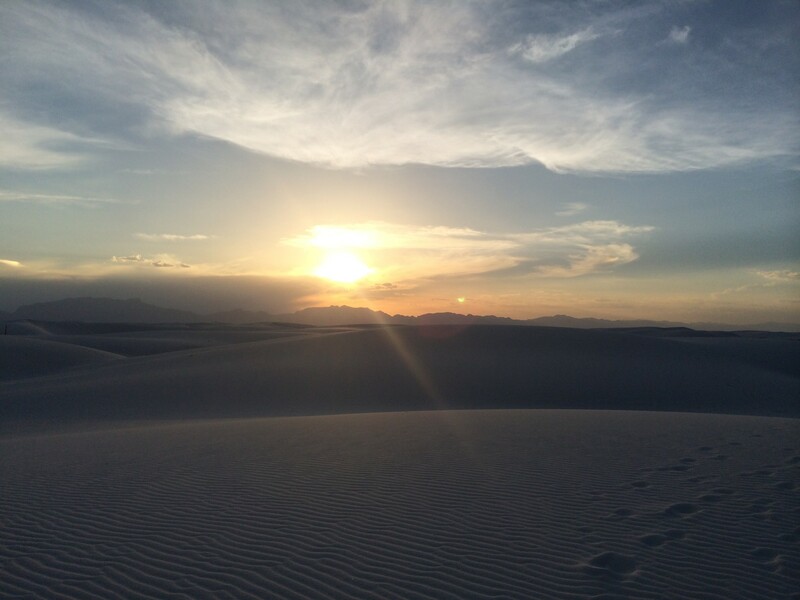 I went to White Sands for the first time this past June, and it was a lovely park. We didn’t spend too much time there, but I’d love to camp for a night if I return. Phew! That was an intense story! I am so glad everything was okay. These lessons that you learned are important, for both you and the kids. I think everyone probably learned something valuable from the experience. I still can’t believe it happened and that I let it get so crazy! We definitely learned our lesson.